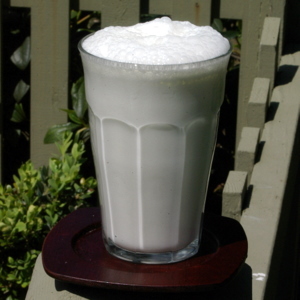 You can’t claim to be a cocktail geek if you haven’t tried to make a Ramos Gin Fizz. This New Orleans classic was created in the 1880s by Henry C. Ramos for his bar at Meyer’s Restaurant. He started with a blend of gin, citrus, and cream, then added some orange flower water for a burst of exotic, floral scent and flavor. Egg white is then added and shaken hard and long for a fabulous, light drink. To get the light frothiness requires a heck of a lot of shaking. At least a minute, and more like five or six if you want to really experience how gloriously light this drink can be despite the heaviness of the cream. In the drink’s heyday, multiple boys would be on hand to take over shaking a drink if the one in front became too exhausted. I love this drink, especially when it is shaken properly, but I can’t make it too often myself. As a computer programmer, I have a touch of RSI in my wrists, and shaking for several minutes can be painful. The dry shake method can help limit the shaking necessary once the ice is added, but even then, I find that at least two minutes, dry and iced combined, is the bare minimum. That was until I got my new milk frother. I’ve see seen these in use at Vessel and Rob Roy, and finally decided to get one myself. What a great time saver. I was able to dry froth my mixture for sixty seconds, then shake with ice for 40 seconds, well within my comfort zone. And the result was probably the best Ramos Gin Fizz I have ever made at home. If I didn’t know there were two full ounces of milk in this drink, I’d make another, because within 15 minutes, I had downed the whole thing, it was so light and refreshing. Combine all but soda water in shaker. Froth for 1 minute with milk frother. Add ice, shake until well chilled (at least 30 seconds, go for a minute or more). Strain into collins glass and top with soda water. We’re looking at a gorgeous Memorial Day weekend here in the Pacific Northwest, and this light drink is a great way to kick it off. What’s your favorite way to save effort in making drinks? I’ve been making do with a blender – I can shake one drink for several minutes, but not two or more. You are yet another person who has had good luck with a milk frother / stick blender / hand blender / stick mixer – I’ve also read people who use drink mixers (like for a milk shake) and while I love those egg white drinks, I’m not sure I want to commit that kind of bar space to a mixer.